We think of creation as being a unique and singular activity but one of the benefits (?) of living six plus decades is that you start to realize that there is nothing new under the sun. Everything has predecessors. I recall my creative writing teacher in college telling us that all possible plots were already told in The Decameron by Boccaccio. Everything written since then was just an adaptation. The Universe was created (method open to discussion and debate) but since then there has only been rearrangement. Maybe we should call it playing rather than creating. 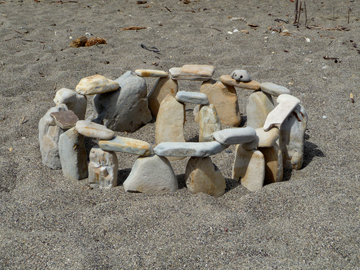 A couple of weeks ago, I was at the beach and found a miniature Stonehenge. Someone before me had been playing. And, since he or she, had not copyrighted, trademarked or patented the playful borrowing from a time long ago, I felt free to re-borrow it. It is a giggly feeling to be in such intimate co-creation with someone I'll never meet or know. I cannot perceive this person with my five senses yet it feels like our spirits are dancing together. Perhaps that's the gift of creativity because anytime we are "creating" we are in this dance with other spirits, with the Universe itself. It is a delicious feeling of connection to a wide web that transcends space and time. I like the results of your re-borrowing. 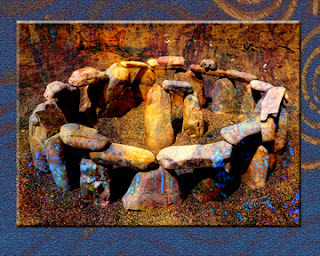 The piece looks as those it's in a cave. I too like the results of your co-creation. And I love the colours you're using! Beautiful!